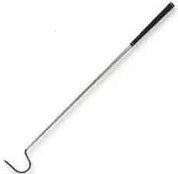 Snake tongs are humane and effective reptile handling tools that can be used as an extension to your arm for just about anything. 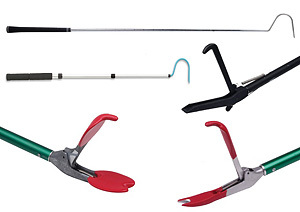 These snake tongs are state of the art, light weight, strong, and durable tools designed to give maximum holding pressure with minimal risk to you and the viper. The handle grip commands a steel cable, which activates the jaws. 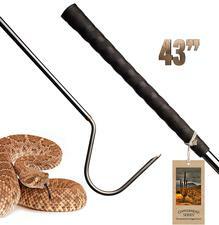 This provides the handler with a precise feel of pressure being applied to the snake or other reptile. 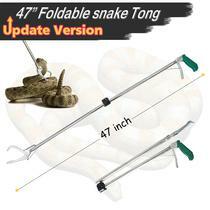 Please note that items shown on this page are not actually sold by SnakeProtection.com, but because many customers have asked about snake tongs and hooks, we have listed products below that you can purchase from Amazon. This product is good when you need more length than the standard 40 inch snake tongs. It features a new improved gripping mechanism, aircraft grade tubing material, and a beautiful blue finish. A hand contoured pistol grip style handle is a standard feature. Made in the USA and has the Midwest logo engraved on it. Midwest has been taking care of various exotic animals for over 30 years, so all products are designed and tested with safety (for you and the reptile) in mind. Foldable Design makes it portable to use and easy to store. Spring Mechanism provides better grip without dropping or losing snakes. Non-slip hand contoured pistol grip style handle is comfortable to hold. 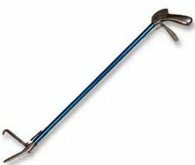 52 inch Pro SNAKE TONGS Reptile Grabber - Rattle Snake Catcher - WIDE JAW Handling Tool is a must if there are unwanted snakes/reptiles near your home, or you have pet snake, or you are going camping and may encounter vipers. Professionally designed to handle snakes and other reptiles safely. 52 inches from handle to widejaw stainless steel cable. These high quality hooks are made from space age alloys for strength and safety. 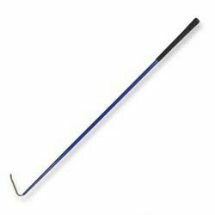 The hook insert is made from a solid anodized aircraft grade aluminum rod and is blue in color. Made with a slightly flexible stainless steel shaft and an aluminum hook 3 1/2 inches wide at the end. Midwest brand's new Professional Field Hook is designed to help you turn over rocks, boards, tin and other items in the field. You will be amazed at the strength of this lightweight tool. This tool has a right-hand bend with a super grip textured end -- a much better grip than anything you have ever used before. Durable titanium and aluminum construction. Snakes scare us— most of us, anyway. This fact is true for horses and cattle, too. They will spook at the sight of a snake, and rightly so. In the wild, a grazing animal could meet an untimely death if the snake beneath its hooves is poisonous. When a snake is in our yard, barn, pasture, or home, we usually just want to get rid of it as fast as possible so it won't be a threat to humans, pets, or farm animals. There are a number of ways to safely catch a snake. The first thing, though, is to identify the species. A non-venomous snake will be a lot less challenging to remove than a venomous snake. Many experts can pick up a snake behind the head without fear of being bitten, however, a novice snake handler should assume that touching the snake means it is very possible for a bite to occur. If you think the snake is venomous, or simply don’t know one way or the other, you are taking a chance. Every year, hundreds of people are injured because they try to catch a snake on their own, so it may be in your best interest to call a professional wildlife expert. 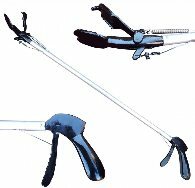 If that's not possible, special instruments such as snake tongs make handling snakes easier and safer. Snake tongs can be used for smaller snakes, a snake hook for bulkier snakes, and you'll need a strike-proof snake sack to hold the snakes in. Thick welder's gloves can protect against the small teeth of non-venomous snakes, but NOT against the large fangs of pit vipers like rattlesnakes, copperheads, or cottonmouth. Wearing snake boots or snake gaiters is also wise.